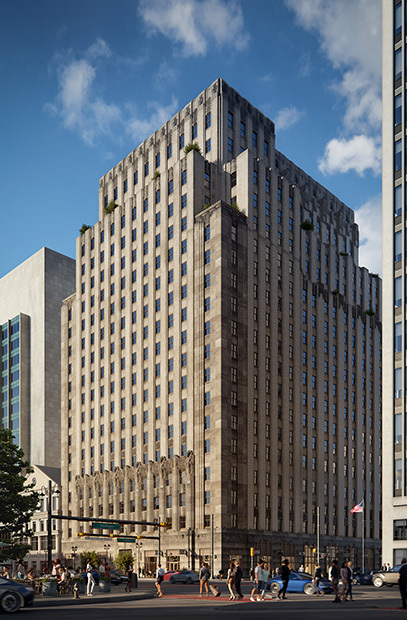 As part of L+M continued investment in Newark, L+M acquired the 440,000 square foot building, and historic home to NJ Bell (subsequently, Verizon) at 540 Broad Street. Built in the 1920’s and a great representative design of architect Ralph Walker, this building, with its grand lobby and distinctive façade, is to be adaptively reused to support 265 mixed-income apartments, offices and ground floor retail spaces. Having acquired the property in May 2016 in a partnership with Prudential Financial, L+M looks to deliver for initial residential occupancy by 2019. Walker House wins the New Jersey Future 2019 Smart Growth Award. The art deco tower at 540 Broad Street will feature 265 units, including about 50 affordable residences and over 80,000 SF of office space. The name of the historic 540 Broad Street building is finally revealed. L+M’s contribution to the city’s resurgence include development of Hahne & Co., restoration of the former NJ Bell building and renovations to Georgia King Village. Per Scholas will offer free courses at classrooms located in the historic New Jersey Bell Building at 540 Broad Street. Designed by famed architect Ralph Thomas Walker and known for its majestic lobby and brick-and-sandstone exterior, the building is being renovated by L+M Development in Newark. The renovation will bring mixed-income housing and more than 80,000 square feet of Class A office and retail space to the landmark 21-story building. The 21-story building will include mixed-income housing and more than 80,000 square feet of Class A office and retail space. Landmarked Ralph Walker-Designed building is Development Team’s latest investment in Downtown Newark’s revitalization. Citi Community Capital and Goldman Sachs Urban Investment Group Will Provide Construction Financing. L+M Development will convert 540 Broad St. into a mixed-use tower with office and retail space. A local office building that will be converted into apartments is slated to contain affordable housing.